Clip anywhere, go everywhere for convenient protection from yellowjackets, hornets, wasps and bees! The Yellowjacket Repellent GoClip™ repels multiple species of yellowjackets as well as paper wasps, hornets and bees. 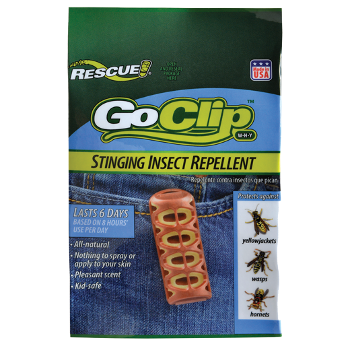 The Yellowjacket Repellent GoClip™ is infused with all-natural essential oils that protect your personal space from yellowjackets, hornets, wasps and bees with a “spatial” effect that deters them from landing on you.